The Shaker style Ellington Bedroom Set in Brown Maple Wood is a beautiful set that really showcases intricate detail and clean lines. The gently tapered legs and headboard panels help make this Amish made bed a masterpiece! This Amish bedroom set is shown in Brown Maple Wood with the OCS-228 Rich Tobacco Stain. 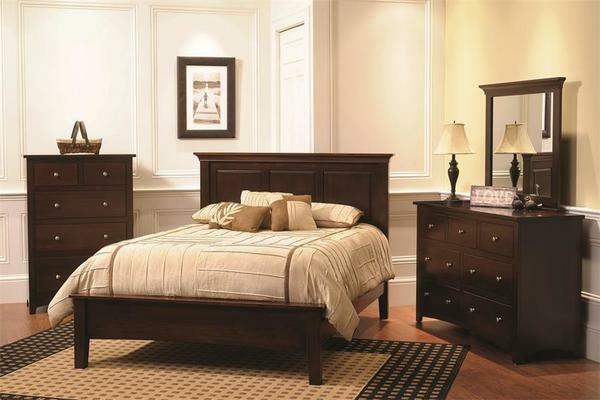 Select a Queen or King Size Bed that is handcrafted from Brown Maple wood and finished off with the Rich Tobacco stain. This Amish made bed comes standard with pegged support and rail brackets for added strength. The Amish Ellington Chest of Drawers has the ability to pull your entire bedroom together! This chest of drawers is standard with five dovetailed drawers that have full extension drawer slides. There are two small drawers at the top for lighter clothing and accessories. The bottom drawer has more storage space than any of the other drawers providing you with a spot to store away your bulkier clothing items such as sweatpants, winter clothing, costumes or whatever else you want to store away for a long period of time. The Ellington Dresser has four large drawers and three smaller drawers at the top. Each flush mounted drawer is standard with dovetailed construction and full extension ball bearing side mount drawer slides which gives you access to the complete storage area inside the drawers. The large top on this dresser is a perfect place to set family photos, a jewelry box, or other everyday essentials for easy access. Add the optional mirror that is shown in the main image for a perfect complement to your dresser, providing you with the optimal place to get ready in the morning before heading out for your day! Add a nightstand, or two for you and your partner so you will have ample storage for all of your bedside essentials. Store away your book(s), flashlight, and wallet inside the drawer of the nightstand. Place your alarm clock and phone on top of the nightstand for a perfect place to charge it while you sleep at night. Give one of our Amish Furniture specialists a call at our toll free number 1-866-272-6773 with any questions that you may have!